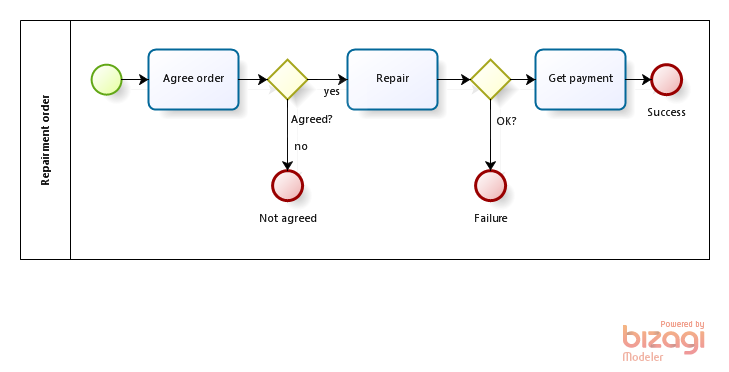 Question #1 of BPMN-based process analysis: what are we going to do - Command or Respond? Command means using orchestration only, i.e. 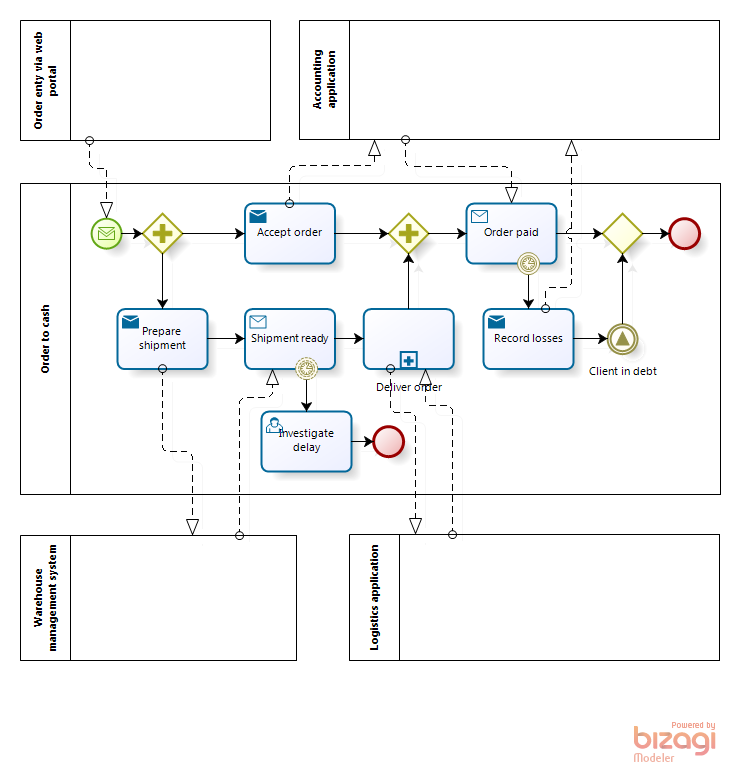 model within a single BPMN pool. Respond means providing handlers for events raised by external entities (clients, partners, government agencies), internal services and/or enterprise software systems. Scenario 2: High intensity process. The problem of the model in Fig. 1.1 is the “Get payment” task. The only thing a performer can do is to call the customer and remind to pay the bill, but it won’t make the job done. This issue could be ignored when there were few unpaid invoices but if one expects hundreds or thousands then the model in Fig. 1.1 would produce hundreds or thousands of “non-tasks” flooding the to-do list of the process performer. Not very convenient, to say the least. The same patterns and Command vs. Respond choice occurs when we are waiting for documents from a business partner or a truck delivering goods ordered. Three instances of the “Get offer” task would hang in the performer’s to-do list for a week - not a big deal. 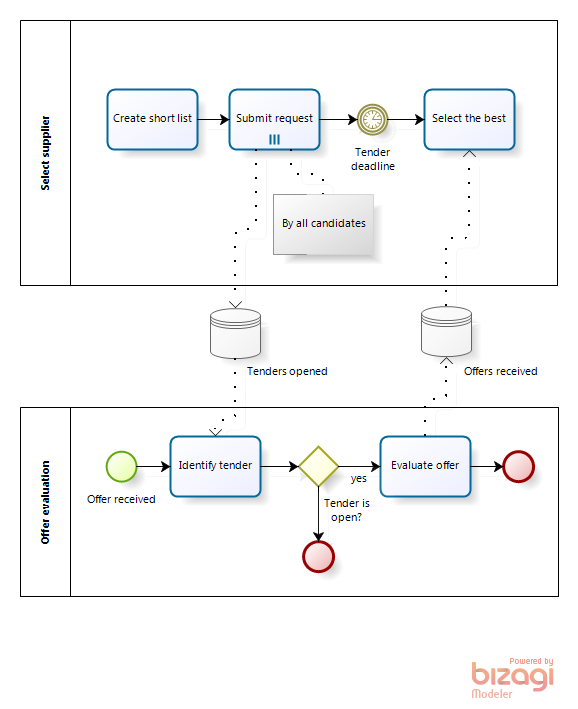 Scenario 2: A large organization, up to 10 tenders running in parallel, up to 10 candidates in each, tender timeframe up to 30 days. With the model in Fig. 2.1, up to 100 instances of “Get offer” task will hang in the performer’s queue for about 30 days. Again, it’s a “non-task” because it’s beyond performer’s control. The same patterns and Command vs. 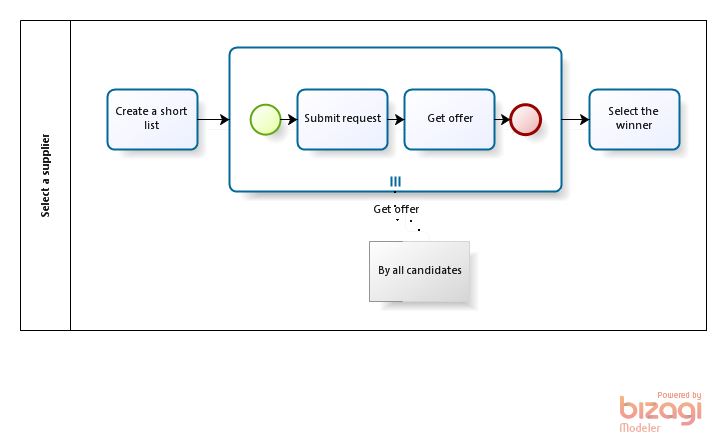 Respond choice occur in the Hiring process - it’s a competition of employee candidates instead of potential suppliers. Now let’s look at the purchasing process from supplier’s perspective. It can be argued that the proposal has an expiration date so we may end the process after that. But in practice the deadline is often imposed by the supplier only to push the buyer hence suppliers agree to accept terms formally expired. 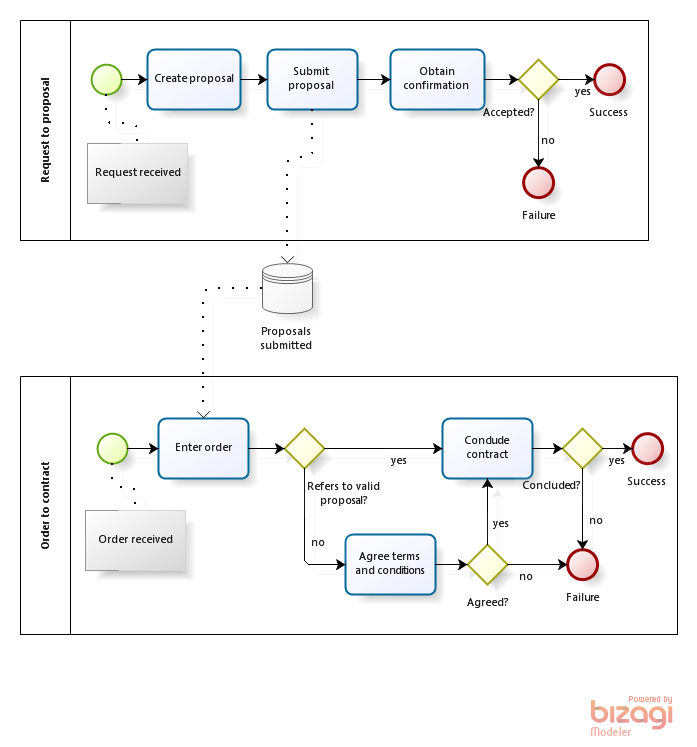 Another process may be added that would scan submitted proposals periodically and push sales manager to contact the customer. Because internal orders are accumulated in the buffer before getting into manufacturing, the order fulfillment time seems to increase. But if we don’t plan manufacturing its effectiveness will drop down so dramatically that the client will suffer even worse. Having an input buffer is more comfortable than working at a pace imposed from outside so not only manufacturing but any other function may request it. Yet it should be provided to the critical resource only or the overall process quality would be compromised. The same patterns and the same choice Command vs. Respond occur in the “Payment Approval and Scheduling” process. Sometimes the working capital may be the critical resource. If this is the case, the payment requests should be stored in a buffer and ranked by priority. Another case is CFO as a critical resource - it’s more comfortable to approve a list of payment requests once per day or once per week than one by one in a real time. The choice Command vs. Respond would occur more than once in a decently complex process. 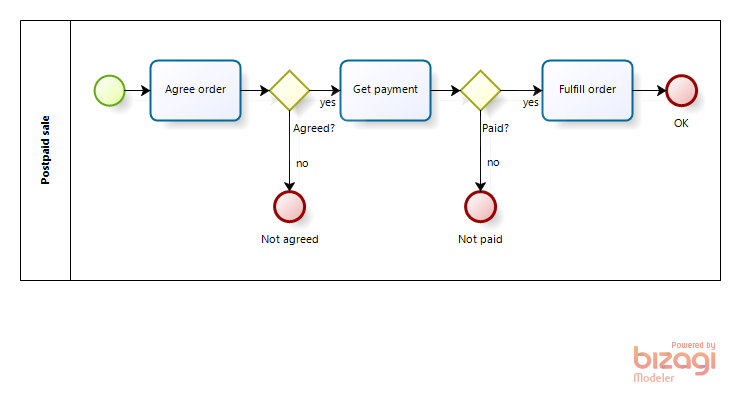 As an example, “Get payment” in the diagrams above may be implemented one way or another according to Fig. 1.1 and 1.2. Although each system implements its function well, the control may be lost in transition between systems. End-to-end process visualization, execution and monitoring within BPMS are much more efficient than point-to-point systems integration. Technically BPMS interact with enterprise systems by calling their functions via web services. (If the legacy system does not support web services then ESB may help to translate a web service call to a specific interface and back.) 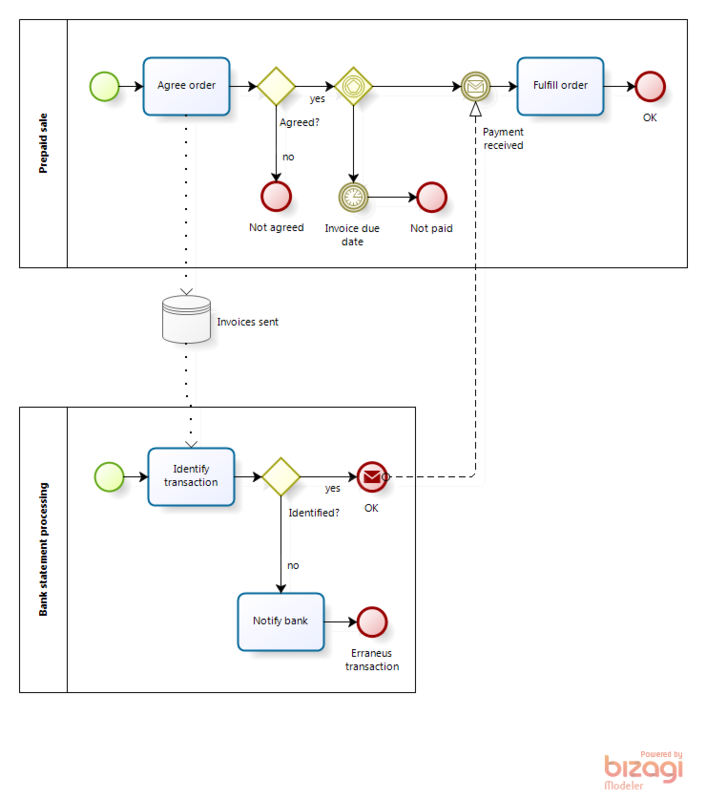 The enterprise systems code should be modified by introducing callbacks to BPMS after the next function is completed - these calls initiate BPMN events. All essential functions are performed by enterprise systems, BPMS responds to events happened (the order is paid) and also (an important point) to events that didn’t happen (payment timed-out.) BPMS responds to an event that happened by calling another system and to an unhappened event by triggering an escalation (”Investigate delay,” “Client in debt”). We are dealing with supporting process not interfering with the external customer. Quality of the process is more important than resource usage efficiency. The intensity of the process is low - few process instances run simultaneously rather than tens, hundreds or thousands. 2. 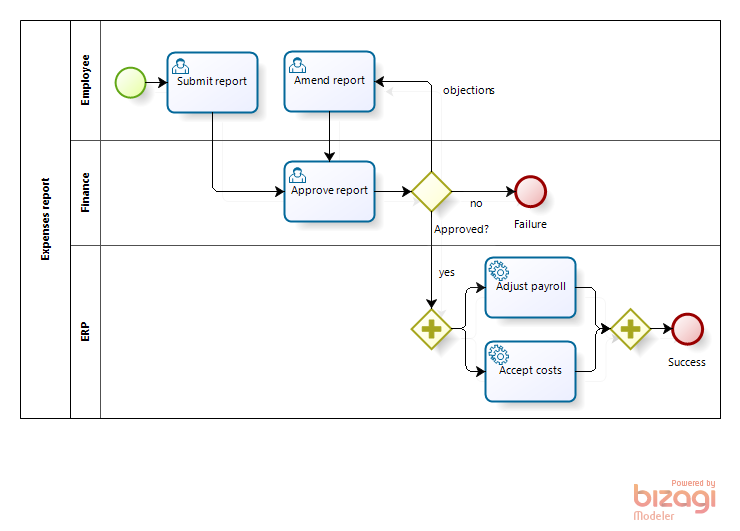 If you only know how to Command or a vendor/consultant demonstrated only the ability to Command on supporting processes like “Vacation request” or “Expenses report” then you know less than half of what is needed to know about the process analysis with BPMN. And you are at risk to face unpleasant surprises when switching from PoC (Proof of Concept) to core business processes. Прежде всего, спасибо за пост! Из моей практики, определение границы между оркестровкой и межпроцессным взаимодействием - один из самых сложных вопросов. Сложность его в том, что нужно сделать выбор между качеством процесса и эффективностью загрузки ресурса. Для ключевых процессов такой выбор носит стратегический характер. Я со студентами попробовала применить BPM к деятельности одной из фирм в нашем городе. Как, на Ваш взгляд, у нас это получилось? Ссылка: Волчихина Л.С., Тихомирова А.В. ПОВЫШЕНИЕ ЭФФЕКТИВНОСТИ УПРАВЛЕНИЯ ИСПОЛНЯЕМЫМИ БИЗНЕС-ПРОЦЕССАМИ КОМПАНИИ “ДЕЛЬТА” НА ОСНОВЕ BIZAGI BPM SUITE // Материалы V Международной студенческой электронной научной конференции «Студенческий научный форум» URL: http://www.scienceforum.ru/2013/61/2495 (дата обращения: 17.02.2013). То, что студенты (с Вашей помощью) пытаются решать такие задачи и смотреть на бизнес через призму процессов, безусловно, радует. 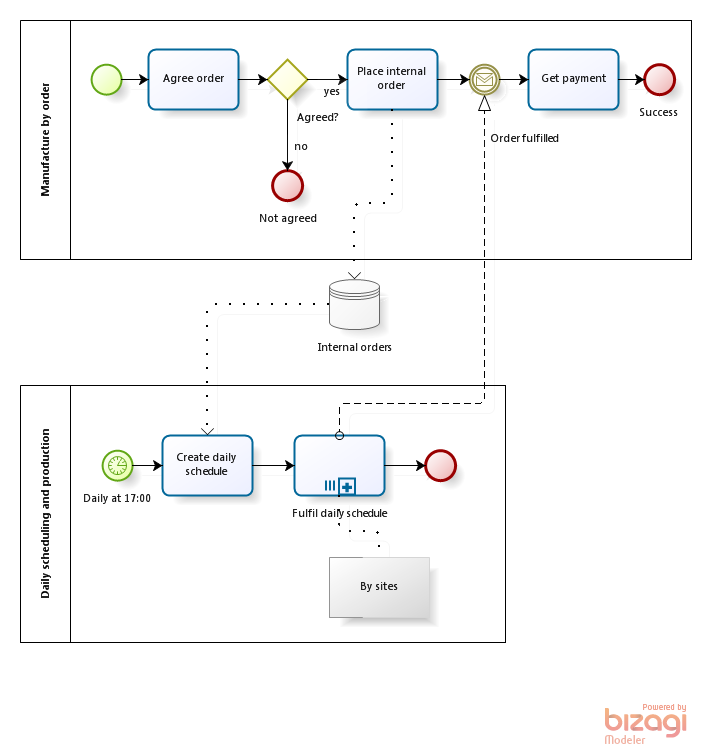 1) Bizagi BPM Suite, в отличие от бесплатного Bizagi Modeler, не является ни бесплатным, ни свободно распространяемым. Это относится и к версии Xpress, и к Enterprise. Хотя, действительно, любой желающий может скачать и установить софт, который не ограничен ни по функциональности, ни по времени использования - только по числу пользователей (10 для Xpress). 3) В потоке управления за развилкой по событиям (схема to-be) может стоять только обработчик события. I agree - the BPMS ability to support interprocess communications matters a lot. Some tools miss messages, others are not friendly in sharing data which is equally important as you can see from the patterns above. It’s a trap as I tried to explain here http://mainthing.ru/item/605/ because typical PoC doesn’t go that far. I’m glad you missed it. Sorry, Anatoly for asking this here. It’s actually for David Mann. I have also started to use Activiti some weeks ago. You comment on its lack of inter-process communication in Activiti interests me a lot. Do you have an email, pls?